After a record wildflower bloom this year, Texas is now expecting unusually high numbers of monarch butterflies. This is the perfect year to plant that butterfly garden you’ve always wanted. Monarch butterflies travel through central Texas two times every year, on their way to Mexico for the winter and again when they return to Canada for the summer. On the Texas A&M website, Craig Wilson, director of the USDA Future Scientists Program, notes that the migrating monarch population has increased by 144 percent in the past year. He is estimating that we could see 300 million monarchs pass through the state, and that’s encouraging after several years of declining numbers. In an article from the Monarch Watch blog, Chip Taylor outlines some of the factors that influence monarch population sizes. Thanks to a healthy winter in Mexico with low mortality rates, and good weather over Texas and Oklahoma during the March-May migration time, numbers are projected to increase at the highest rate in several years. “Some consider this year to be a throwback monarch migration, potentially with trees covered in monarchs,” said Lisa Keys, Science Mill Animal and Plant Care Technician. “I've already seen more butterflies out in the garden this year compared to previous years, which is really exciting." Attracting monarchs and other pollinators requires the right kinds of plants. Central Texans can expect to see the monarchs anywhere there are milkweed plants, a monarch favorite. Our home state boasts large swaths of milkweed. The butterflies lay their eggs under the leaves, and feed off of the plants. When planning the Science Mill’s brand new butterfly garden in our Science & Art Park, we learned that not all milkweed is good for monarchs. It’s important to get native plants that are in sync with with our local seasons. This goes for other varieties of plants in your garden, too. Encouraging healthy pollination locally can have a global impact. Once your garden is in, you can be part of this year’s historical monarch migration by reporting sightings and following their journey to Canada on the Journey North website. You can check out our Butterfly Garden at the Science Mill! 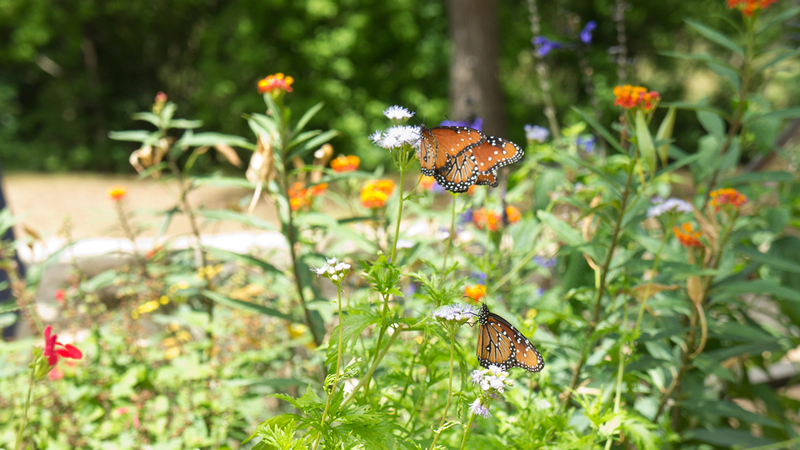 We would love to see pictures of your visit to the Science Mill’s butterfly garden and of your own garden. Share them on social media and tag the Science Mill! You can find us on Facebook, Instagram and Twitter. P.S. - Become a Science Mill member and get a free butterfly book! Starting April 19 we are giving away a free butterfly book* for every new or renewed membership. We have a variety of books to choose from - there’s something for every age. This promotion only lasts until April 30, or until we run out of books, so don’t miss out! *One book per membership, while supplies last.